The always-theatrical Rob Zombie made the leap from musician to horror movie auteur with 2003's House of 1000 Corpses (say what you will, sweet title) with the intention of making horror movies "like they used to" full of schlock and gore without any redeeming social value. The aforementioned film's sequel, The Devil's Rejects, continues that grand tradition. The eponymous band (whose name conjures up a track from Morrissey's most underrated album, probably not intentional on Zombie's part, I imagine) is a family of serial killers now on the lam after the blood-soaked events of House of 1000 Corpses (or so I've been told). 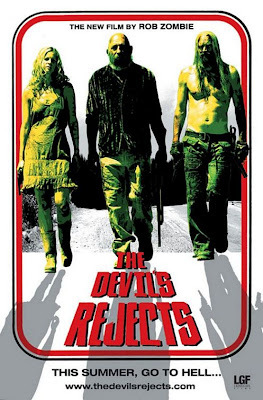 The three surviving members- Captain Spaulding (Sid Haig), Otis (Bill Moseley), and Baby Firefly (Sheri Moon Zombie- the director's wife, go figure), flee their bloody compound after a brother of one of their victims swears revenge and brings down the full righteous force of the law on their heads. Fleeing their bloodthirsty nemesis, the bloodthirsty trio torture and murder their way across Texas in an attempt to continue torturing and murdering their way across Texas. Despite some very well written and often-hilarious dialogue, Zombie's film succumbs to horror's oldest threat which is to place the substance of storytelling below the substances that flow out of the human body when it's hacked apart: gore over story, one could say. An attempt to make a more "extreme" horror film ends up putting style over substance and what we're left with is essentially an extended homage to The Texas Chainsaw Massacre complete with 1970's Texas setting and serial killer families. If not for some actual good dark humor throughout, this one might be have been a near-worthless torture-fest. Check it out if you must, but I think we're all better off with Werewolf Women of the S.S. But was it scary? Gory to the extreme, and always in bad taste, but rarely frightening. However, children of the 90's will be forever scarred for two Nickelodeon-related reasons: 1) E.G. Daly, the voice of Tommy Pickles among others, plays a prostitute and 2) Kenan's Dad (who, holy crap, was Peter from Dawn of the Dead!) plays her pimp, and engages in a discussion with a redneck about the merits of buggering poultry.